Houses & Homes VA: A Beautiful Kid’s Room on a Budget! A Beautiful Kid’s Room on a Budget! Every child deserves a nice room but it should also be what they like, right? That’s not hard to do but money is always a consideration. Here’s a simple 4 step plan to give your child a room they’ll love that won’t require a second mortgage! It’s always best to decide exactly what you want to do before you start. This will help you to easily stay within budget and gives your child a chance to be part of it too! You already know what your little angel likes so why not design a theme for the room that matches? It doesn’t need to be an actual recreation of their favorite character or cartoon. It could be something as simple as painting the room using the same color scheme. As an example, if your child loves Superman you could use red and yellow paint and stencil a large “S” on the door. If Cinderella is the hero pink and white would be an option. Nothing complicated here and by the time your little one has a new favorite it will be time to repaint anyway! After the painting is done you will definitely want to add some decals on the walls and possibly even the ceiling. You can buy decals at many home improvement stores or art supply outlets but there is a less expensive way to do it. If you have access to a computer and printer you can buy sticker sheets and simply print any images that you find on the internet! It doesn’t get any easier than that and you will be able to decorate the room with your child’s favorite character(s) for very little time and money. Now that the walls are painted and adorned with the decals, a few posters could look good as well. One of my favorite ideas is to frame or hang things on the walls that the child has made themselves. There are a lot of choices here and it will show your child just how proud of them you really are! The possibilities here are endless and could include such items as his/her picture from art class, an achievement award from school or that last report card. The point here is not only to make the room look good but also to make it personal and something that he/she can be proud of. If you plan to keep the furniture that’s already in the room just be sure that it will match the new design that you are planning. Obviously a Victorian style bed would look a bit out of place in the midst of Spiderman’s lair! If you intend to buy furniture for the new project I suggest looking online as one possibility. There are some great deals to be found and the choices are endless. Other options would include traditional furniture stores, garage sales and maybe even a local thrift store. If you plan to keep existing furniture but it doesn’t match the new scheme that you have in mind it’s always possible to repaint or refinish and a few strategically placed decals could be the perfect solution. 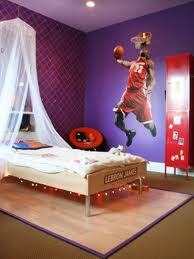 Now your child has a bedroom that they love and can enjoy and you did it together!